I never thought that I could be so intrigued by a Western. Although immensely popular in the past, the genre has died out and has had a hard time coming back, aside from Clint Eastwood's "Unforgiven" in 1992. It's hard to make a Western good because, honestly, nobody's really looking to see them. Even so, it's 2007 and here comes along "3:10 to Yuma" from director James Mangold ("Walk the Line"), a remake of the 1957 film of the same name. And believe it or not, I bet this remake is a better film than the original on which it's based. It's a brilliant revival of the Western, saving the genre from pointless gunslinging and thrusting it back into a story of morality. A poor rancher named Dan Evans (Christian Bale) lost his leg in the Civil War and has been struggling ever since then. His ranch is facing a drought, and he barely has enough to support his wife, Alice (Gretchen Mol), and his two sons. There's also a bullying man trying to rob Dan of his territory, who has already burned his barn and threatens to destroy his home within a week. Then there's Ben Wade (Russell Crowe), a reckless and notorious robber and murderer who is accompanied by a ruthless but loyal gang. As if destined by fate, Dan Evans witnesses Wade and his group taking down a Pinkerton coach, lead by bounty hunter Byron McElroy (Peter Fonda). 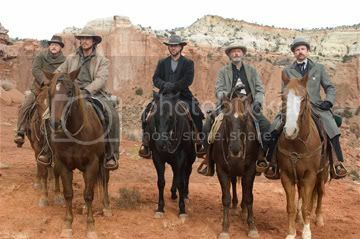 Wade gets caught, and Evans offers to join the group escorting the handcuffed outlaw to the nearby town of Contention. It's here where they'll put Wade on the 3:10 train to a prison in Yuma for him to be hanged. Evans worries that he has lost all affection from his wife and all faith from his older son, Will (Logan Lerman). To prove to his family that he can make the ranch work, he accepts the $200 offer to help transport Ben Wade. The journey along the way is more complicated than expected as it tests the character elements of both Evans and Wade. The two men feed off each other, and the best scenes are those in which Wade pokes at Evans, who is his moral opposite. "Your conscience is sensitive, Dan," he states. "It's not my favorite part of you." Even though his father told him to stay at the ranch, Will follows him and the group, and actually saves them from Wade when a tricky changeover occurs. Even though he had a gun pointed at Wade, there's a fascination in Will's eyes when the outlaw starts talking about the easy life in Dodge City with gambling and loose women; Will admires certain aspects of Wade and strives to find those traits to admire in his own father. The relationship between Evans and Wade is a tough balancing act to portray, but Christian Bale and Russell Crowe are talented actors who pull it off superbly. Although they travel through dangerous Indian territory and are persued by Wade's gang, the biggest challenge of the journey is dealing with Wade; he's a man shrewd and clever enough to get under your skin. Bale not only plays the noble hero, but he also plays a hurt man who is fed up with not having done anything right but finally takes a stand for something he believes is good. Although Wade offers Evans more than the $200 to let him go, he doesn't accept it because it's about more than the money. Crowe plays a ruthless and manipulative bandit, yes, but he's also a man who surprises even himself with his tactfulness and intelligence. The relationship between Evans and Wade works so effectively because there is a certain depth they provide in giving their performances and dialogue deeper meaning. The final scene in a small hotel room is a ticking countdown to the 3:10 train and also a psychological showdown between the two main men. The hotel is surrounded by Wade's gang lead by his second-hand man, Charlie Prince (Ben Foster); they either want to retrieve their leader back or kill everybody in that hotel. Surrounded by possible death and waiting for time to pass, Evans and Wade start to talk. As much as Evans tries to despise the man sitting across from him, there's no denying that these two men have found an equal to him in conversation. This final conversation is played with subtlety and with words that have more to them than what's being said. This leads to the race across rooftops and behind alleys to the train station, as Evans drags along Wade. The scene carries a strong power and is a reward of a shootout because there actually aren't that many throughout the rest of the film. "3:10 to Yuma" tells a simple story, but it's a story with simplicity only on the surface because underneath there are plenty of profound issues being explored. It's ultimately fueled by excellent performances and with its harsh language and realistic violence, this Western feels freshly modern, as well. Mangold, however, doesn't allow these traits to define it and there's no overwrought sense of style; it's a great story being told and one with a tough and morally just conclusion.